Mangos have a stone in the center that is about an inch wide. Insert the tip of your knife into either side of the stone. If you hit the stone, don’t worry. Just lift your knife and move it slightly over. Once on one side of the stone, slice through. Repeat on the other side. You now have two ‘cheeks’ that are slightly boat shaped. To remove the skin, place a cheek on your chopping board and slice it in half lengthwise. You’ll now have two quarters. Repeat with the other cheek so you have four quarters in total. Now take your knife and insert it at one end as close to the mango skin as possible. 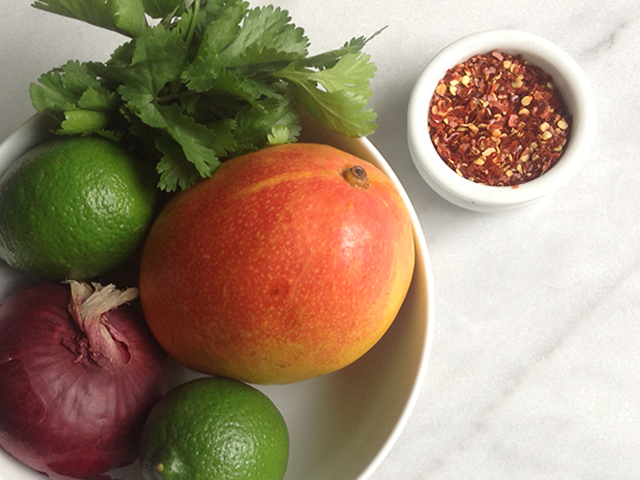 Slide the knife between the skin and fruit to separate the two. 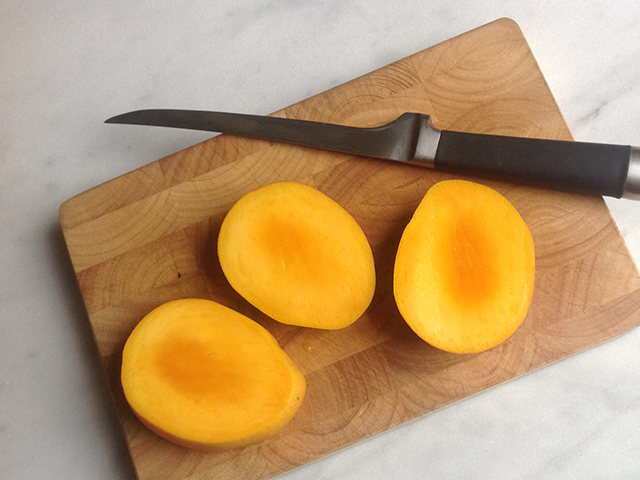 I use a filleting knife for this because it has a slightly flexible blade that I find easier to use with mango. Repeat with the other mango quarters. You can also get an additional piece of flesh off either side of the stone. Dice the flesh. 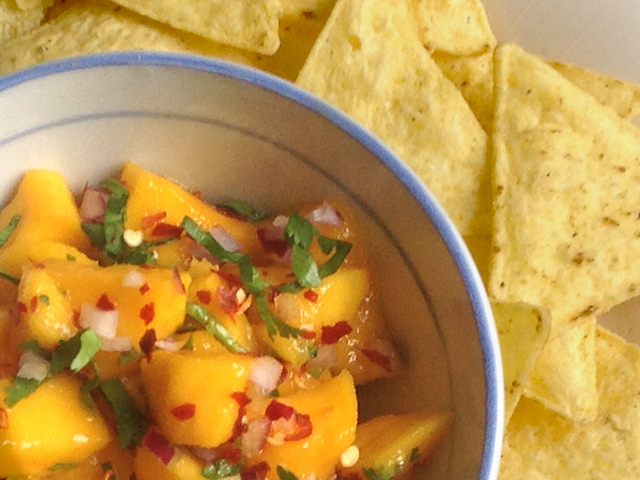 Mix the mango with the other ingredients, check for seasoning and serve. 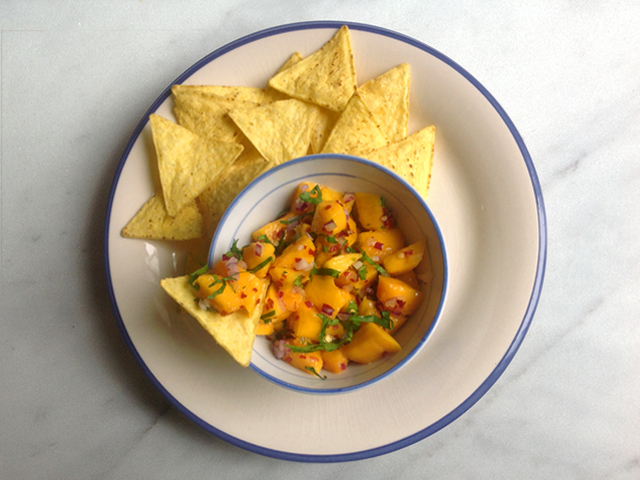 Superb with chicken, seafood – shrimp, scallops, tuna, swordfish (you get the idea) or simply a bowl of tortilla chips. Best made no more than an hour or so before serving.